Missha Belle Epoque Fatal Aura ($27) is one of two sets releases for the Fall 2013 season that includes a Missha Signature Velvet Art Shadow, Missha Signature Glam Art Rouge, and Missha The Style Crystal Nail Polish. Psst…even if they launched it Fall this set screams Holiday! Just look at the stunning red compacts! Missha Belle Epoque Fatal Aura Set is a beautiful selection and showcase of Missha’s finest makeup products. The set comes in a metallic red box and tucked inside you’ll find the gorgeous palette and lipstick wrapped in a gorgeous metallic red casing with the nail polish having a heart shaped red topper. This is why I love Korean makeup products so much! The packaging alone is drool worthy. If you recall last year Missha released two similar style sets for Fall 2012 which included the Missha 2012 F/W Feminine Grace Look Limited Lip Kit and Missha Two Faces of Beauty 2012 F/W Sensual Smoky Look Lip Kit. Both of those sets were lovely but I really love the Belle Epoque Collections much better because it concentrates on nails, eyes, and lips where as last year’s collection was all about lips only. 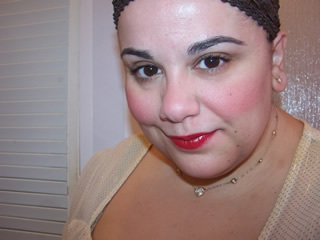 One of my favorite pieces in this collection is the Missha Signature Glam Art Rouge in SRD704. This is stunning shade of darkened berry and perfect for Holiday looks! The formula is creamy with a satin finish that glides onto lips beautifully and wears for a solid five hours. I typically find Glam Art Rouge a bit dry but this formula was perfect! Not terribly hydrating but also not drying or too creamy either. The color is divine as you can see in my look below or at least I think it is. Missha included a how to get the look guide for the Missha Signature Velvet Art Shadow Palette in the set which isn’t in English but easy to follow as it features a diagram with color placement and a label for each shadow as a number. The palette contains six eyeshadows all of which have a shimmer finish although they are not overloaded with chunky pieces of glitter or sparkle. Colors are smooth, creamy, and have a beautiful finely milled powder texture that applies and blends beautifully on lids. They have a rich pigment but aren’t overly done or too bold. Fatal Aura concentrates on a more golden blue look which I know sounds a tad frightening but believe me the gold paired with the brassy gold and silver works beautifully together to create a very sultry eye look! Of course, you need not follow any rules for application each shade works perfectly alone or together. They also include a ruby red Missha The Style Crystal Nail Polish in Blood Sand. At a glance this is a simply a red glitter polish, uneventful at first. But once applied it dries down to a textured sandy matte formula that looks really dramatic on nails! The color doesn’t have any glossiness and the glitter is more subtle due to the matte finish which gives it a very unique look (plus it pairs up beautiful with the lipstick in the collection). Yes, Missha Belle Epoque Fatal Aura was a Fall launch but it works beautifully for Holiday looks! If you have a makeup lover in your life you need to gift I highly recommend purchasing this for them as it would be a great intro to Asian beauty and a very unique set that isn’t something they have likely seen from the beauty world before (unless they are super into Asian makeup that is!). This one gets a big Muse Approval. Grab it now at www.misshaus.com. I bought the Mysterious Aura set before the 40% off sale, but I’m still in love! This was actually my first Korean beauty purchase even though I’ve been eyeing Etude House products for a while. I might have to buy that lipstick! Holy Crow! I really want to hate this LOL. This is stunning! THe colors are really great on you. Lovin’ the eye gig. oh wow these shades were MADE for you! you look amazing! Wow…you look gorgeous in this and you’re right, those colors don’t look like they would pair well at first glance, but you have proven they definitely do! it looks all mismatched and weird when swatched but they actually do work really well together and thanks miss d 🙂 <3! This set is so gorgeous! Muse, could you tell me a bit more about eyeshadows? I’m debating to buy some palette, but I wonder about their lasting and if they alow during aplication. it depends on your eyes tekashi…I don’t really know what eye type you have. I have drier eyes and didn’t wear with primer and they lasts well on me without creasing or fading but if your eyes are oily you might not experience the same results…it’s going to vary from skin type to skin type I imagine. Unfortunately I can only review as tested on myself…hope this helps!? of course eyeshadow primer helps as well to keep shadow wearing long and strong all day if you do suffer from oiliness. If you have dry eyes like me you should be a ok! Thank you for reply. 🙂 Mine are not dry, but I always use primer under eyeshadows. So i guess there shouldn’t be any problem.